As part of the National Bluefaced Leicester Show at the Maryland Sheep & Wool Festival, the Bluefaced Leicester Union will be giving a free demonstration on carding and combing Bluefaced Leicester wool. They will demonstrate the best way to work with beautiful, purly BFL locks and how best to manage the small lock structure through the carding and combing process. Hand cards, combs, and a hackle will be used to show you how to transform your BFL fleece into a preparation ready for spinning or felting. Then you’re welcome to try it yourself. Extra cards and combs will be available. 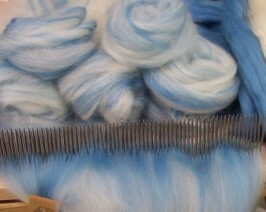 They will also have Bluefaced Leicester fleece for you to try out.